Its three-wheels allow for optimum manoeuvrability while its sturdy steel frame means that it’s been built to last. And the unique ‘One-Touch’ locking lever has brakes similar to a bicycle – squeeze them to slow down or stop, and push them down to firmly lock the wheels in place before seating. 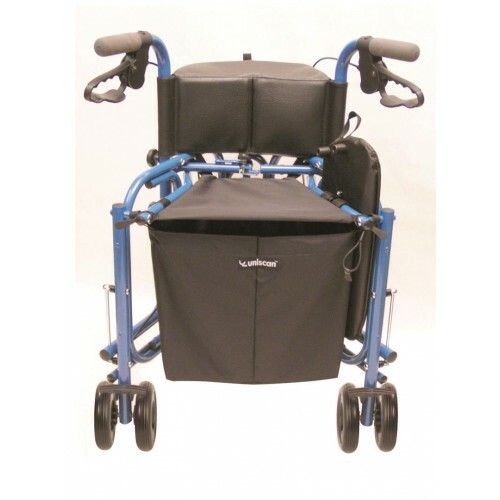 This is a great tri walker, it is very well built and very sturdy. I bought this for my wife, who very pleased with it. There are cheaper options on the market, but I am a firm believer you get what you pay for. I think it is good value for the money. I would recommend. Superb - both the prompt and helpful service and the piece of equipment. I was quite impressed to have ordered the item on Tues morning and by the afternoon of the following day I was using it. The machine lives up to its description in all aspects. It is a great help to me in allowing me further walking exercise and the opportunity to take a rest at any point. It is invaluable to me Many thanks.. This was an excellent purchase. Well made, light-weight and really manoeuvrable. Item delivered in good time, well packaged. This is my third walker from Uniscan - I keep them in different venues. The first was 3 wheels, the second 5 wheels and this one is 3 wheels again. It is lighter than the 5 wheeled one and very stable etc. excellent. 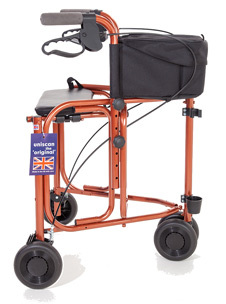 excellent quality, has everything I need, firm seat, walking stick holder, extra carrier available. I particularly like the way the seat can be housed in the side of the walker when not in use. Fantastic buy it came early packaged well. Looks great, seat easy to maneuver overall would recommend this to everyone who is looking for a walker. I was very pleased with my Uniscan Triumph three walker and the the prompt delivery and service from Active Mobility Centre.